Map Description Here it is, my brand-new Deathmatch-Map "DM-Darkov";) It is located in a highly modern weapon-research facility in Northern Sibiria, Russia. 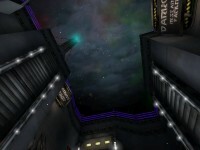 Most important project of the facility is the combat satellite "Darkov Sigma", an orbital ionic cannon firing deadly airstikes against ground targets. (Ever played UT2003?! Forget the Ion Painter!^^) Maybe, there is a possibility, to use it against your opponents...?! BUT: A pretty fast computer is also required because of the high polycounts an the giantic explosion-effect in this Map! DM-Darkov, from the author's readme.txt, is a weapons-research facility in northern Russia, and it looks the part in every respect (except that the signs are in English, not Russian, for which I'm grateful). The map's architecture is excellent, evidencing a serious effort to keep the map visually interesting and thematically consistent. Floors are nicely trimmed everywhere, and decorated enough to look interesting without becoming gaudy. Walls feature many indentations of protrusions of all sorts, holding a variety of light fixtures, piping, or other architectural details. Masked and translucent panels are used often and to good effect. Ceilings are crisscrossed with beams and supports, and some neat features like rails with hanging metal claws that hold boxes suspended above the ground. 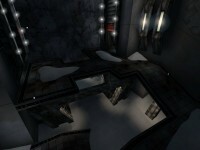 The center of the map is an open-air atrium bounded by the base on three sides and a rocky cliff on the other. The cliff, modeled using a terrain brush turned on its side, looks great, though it gets perhaps a little too pointy at the very top. There are deposits of snow scattered on the walkways outside as well, and again, those might have looked better if they didn't come to a perfect point at the top, but it's not too big an issue. 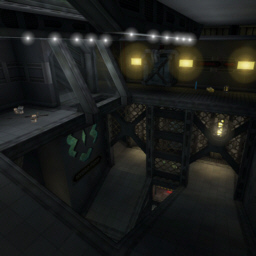 Most of the map's textures come courtesy of ShockSystems' SteelPak, and the author has added several of his own as well. They fit the theme of the map nicely, and are applied with great precision, in terms of both texture choices and alignment. That cliff outside is textured perfectly, such that the transition from piled-up snow to exposed rock is smooth and believable. The map's lighting is very nicely done as well. The colored lights (lots of yellows and a few reds) are pronounced enough to keep the map from looking monochromatic, but not oversaturated. 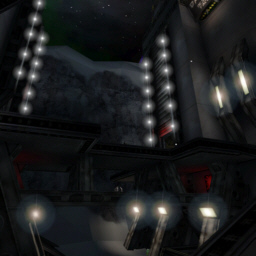 The white lights are not perfectly white and sterile, but have a bit of a bluish cast to them, adding to the cold feeling of the map. I can't say I like that strange greenish cast that part of the sky has, though. The other thing I'm not crazy about here is the use of coronas on the tall, thin lights outside. In part it's the fact that so many coronas so close together looks a little crowded, and in part it's that they make it look like the light is being generated primarily from a small number of points along the length of the light fixture, rather than evenly along the extent of the bulb. Some of the coronas are also a touch too far in front of the lights as well, which becomes noticeable when you look at them from the side. There's a great deal of technical skill to be seen here. 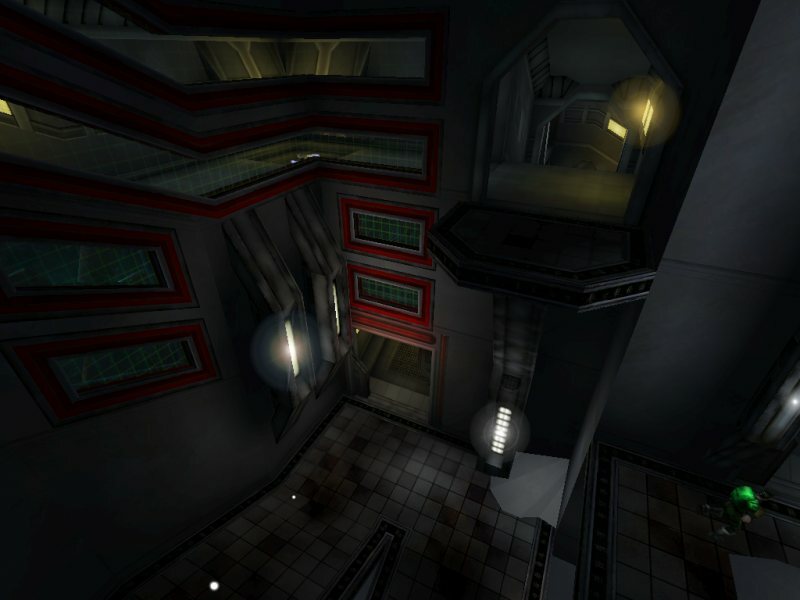 All of the things in this category that you'd normally look for in a good map are here: very low occurrence of BSP problems, strong brushwork, good zoning, correctly functioning movers. I probably would have used a lot more semisolids, ditched the delay time on the lifts, and set the lifts so they don't hurt players who get stuck under them, but there aren't any major problems here. What's really interesting are the extra details the author added. For example, one room has a slowly revolving generator sending out a constant stream of electricity that passes beneath your feet (you can see it through translucent floor sections), and two functional conveyor belts for ramps, one leading in each direction. Outside, a light snow falls from the night sky. The coolest thing about the build is the Darkov Sigma satellite, visible in the sky far above the base, which you can actually use. The thing has so many triggers and events associated with it, it looks like something you'd find in an Assault map. 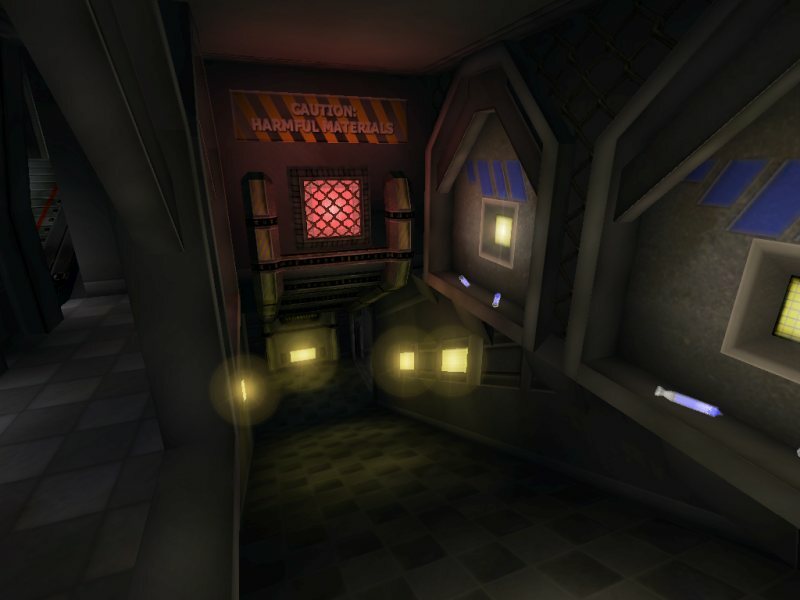 It's controlled from the uppermost room in the base, called the War Room, which is locked when you begin the match and becomes accessible after sixty seconds. 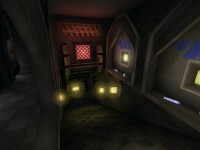 Head up to the War Room and you'll find a control panel; approaching it starts the satellite's attack sequence. 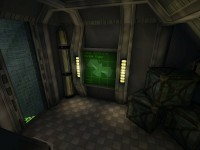 The War Room's doors temporarily lock to prevent the operator from going out and killing himself, and elsewhere in the base, a status screen shows that the Darkov Sigma has made the transition from standby to active. 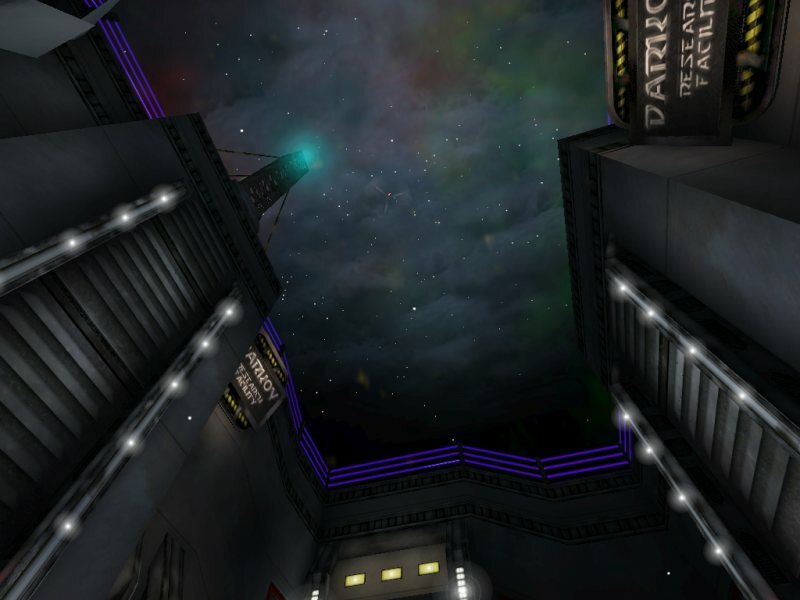 Eight seconds later (a computerized voice and text messages replicated to all players count down the last few seconds), the satellite fires a red beam into the outside and annihilates anyone in the area in a mass of red fog and shockwaves. The weapon remains on standby for a minute and then becomes available for use again. The only oddity is the inclusion of a NullAmmo actor in front of the control panel, so when you activate the satellite, you get the message, "You picked up some ammo," when in fact you're not really getting anything. I think it's just in there as bot candy, but I'm not sure. Anyway, it's all executed very well. This is the kind of additional touch that I love to see in a map. The bot pathing is pretty good for the most part, though the author could have simplified the node network quite a bit; there are far more nodes than necessary. 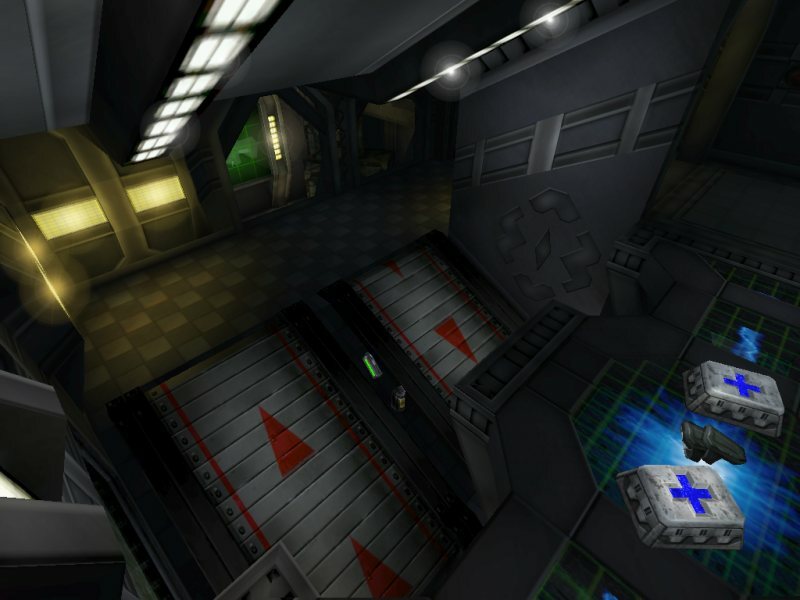 There are jump/translocator paths placed in several appropriate areas, which is something that a lot of UT mappers seem to forget. Bots rarely go into the War Room, but that's probably a good thing, because they behave a little strangely when they do manage to get themselves up there. The few times I saw it while spectating a botmatch, they didn't seem to recognize the different between the satellite being available and unavailable for use. In other words, even if it's only been thirty seconds since the last use and the satellite needs thirty more to recover, a bot might approach the control panel anyway and start running in place in front of it. The bots seem reluctant to leave the area even after they've activated the satellite, too. Thankfully, the fact that the bots tend to stay away from the room renders this a much smaller issue than it might have been. 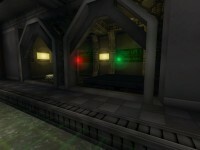 DM-Darkov's layout is a good one, one that deathmatch players should feel right at home in. The small outside area is the map's central and most connected region, with seven ways in or out, so it sees a lot of action. 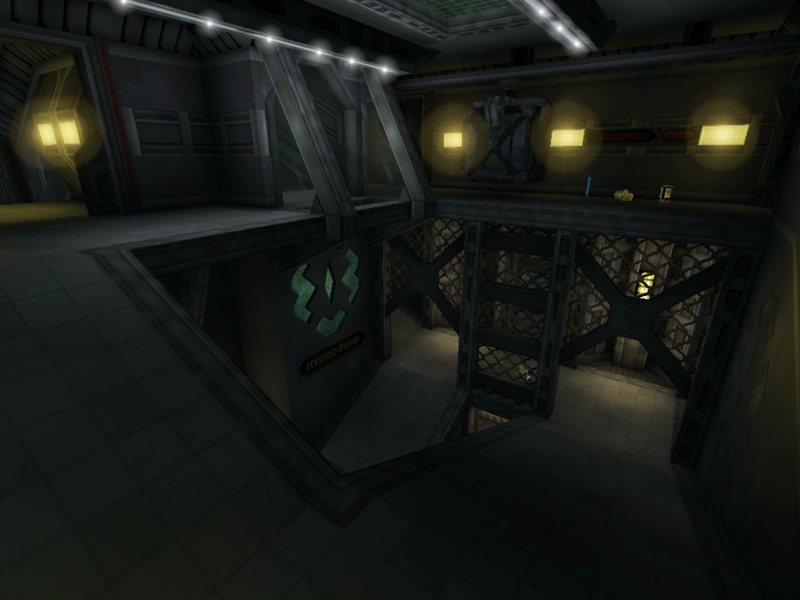 The rest of the map wraps around that area on several levels, so there's no dead space to be found, and z-axis fighting in almost every part of the map. Still, it gets a little tight in many places. 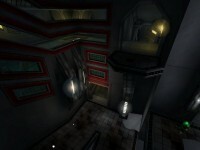 The large number of architectural features along with the relatively small size of most of the map's areas can combine to produce some frustration for players trying to keep moving as they fight. 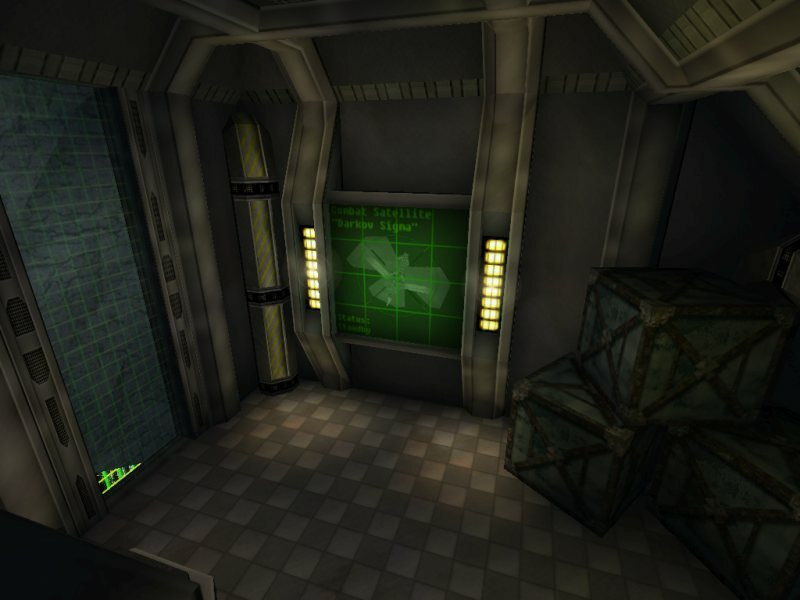 Item placement is good in a general sense, meaning that everything seems to be located in an appropriate area of the map, but items' specific locations can sometimes exacerbate the aforementioned problem with flow. I found many items too close to walls, stuffed into corners, or on narrow ledges just above a drop in the map, usually a ramp or an elevator shaft. Too often I felt like I was going out of my way or making myself unnecessarily vulnerable while collecting basic items like Health Vials and ammo pickups. Granted, these breaks last less than a second, but those little things matter in Deathmatch maps, especially relatively small ones. These problems are attenuated somewhat with lower numbers of players, so I usually liked to keep the player count down. The author recommends six to eight people, but you can easily go down to four and still have plenty of encounters. It could even work for one-on-one. The downside, of course, is that the Darkov Sigma becomes far less useful with fewer players. You'll never get someone who's just passing through the center area; it's best to use it when there are several bots out there who are fighting each other. Despite these problems, this map doesn't get boring quickly and should make for some fun games, whether in single-player or multiplayer. The author's comments mention that you need a fast computer given the moderately high poly counts and the various light effects, but I don't think that performance will be much of an issue for most players. 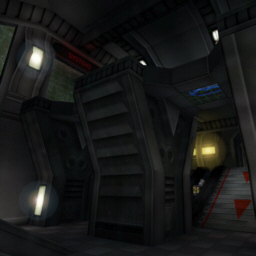 I've seen lower frame rates from maps that delivered far less visual detail. I had a lot of fun reviewing this map. You can be sure that I'll be holding on to it, and I recommend it to everyone. Although the community continues to release maps for the original Unreal Tournament on a regular basis, this is a rare piece of work that stands head and shoulders above most recent offerings that I've seen. Great job, Revelation! I hate the tex! Ok, I only think they look strange. The map is really good, nice Ideas. The Archi is ok, but I don't like it. Omg this map is really cool! An 8.5, I really liked this. And it sure has something *damn* special. really gotta love the ion cannon which you can activate and pulverise anyone outside, twas a beuty! Very cool map. The satellite is one of coolest things i have ever seen in ut. Love how it moves and then shoots out that red laser. Very good job! It's a high-polygon map with lots of trims and pillars. 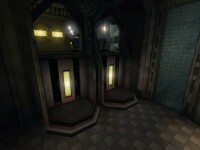 But, it's textures seem a bit too "clean". It's a great map though. It even has the super-weapon in the middle of the map and it's not any Redeemer.